A hint of lemon in the biscuit topper accents the blueberry filling in this ever-popular fruit dessert recipe. 1 of 3 Heat oven to 375 degrees F. Coat a 2-quart shallow baking dish with nonstick spray. Grate the zest from lemon; set aside. Squeeze lemon to get 2 tablespoons juice; reserve. 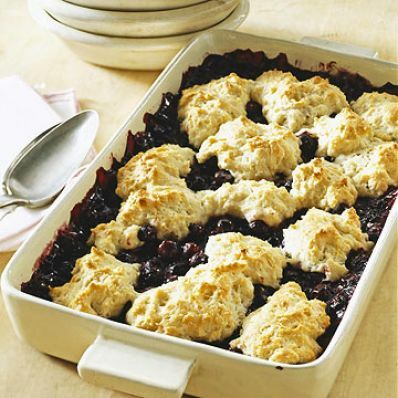 In medium bowl, combine blueberries, 2/3 cup of the sugar, cornstarch, cinnamon and nutmeg; toss. Add lemon juice; stir until combined. Turn into prepared dish. 2 of 3 In large bowl, combine remaining 1/3 cup sugar, flour, baking powder, baking soda, salt and lemon zest. With two knives or pastry cutter, cut in butter until mixture resembles coarse crumbs. With fork, stir in buttermilk just until mixture is moistened. Spoon heaping tablespoons of dough on top of blueberry mixture. 3 of 3 Bake in 375 degree F oven 40 minutes or until mixture is bubbly and top is golden. Let stand 5 minutes before serving. Serve warm or at room temperature with ice cream, if desired. Makes 8 servings.